I haven't tantalized your chess taste-buds with a puzzle for a while now, so here's a humorous one composed by David Gurgenidze in 1973 for you to solve, or otherwise. White to play and win. And it comes with an extra challenge, too. In the chess forum where I found it, it was named: Georgian Pole Dance. This seems rather inappropriate - given it refers to one patch of the action in the solution, and the resemblance is only graphic, not symbolic. 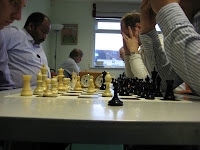 Our chess blog is for more than one thing: Local chess and club news, to have fun, to join in the conversations of the chess blogosphere, as an opportunity to write, to keep in touch with each other, to let others know what we're like - perhaps in case they'd like to join our club - and, so on. But: I warn you now. This particular post is about one thing, and one thing only. Because, this weekend, I achieved something I thought I'd never do. I drew against an International Master. No, I don't mean on the internet, or in a simul, or in a friendly game, or in a rapid-play game, none of which to me really matter so much. I mean in an over-the-board game, in an Open tournament, where money was at stake, a graded game, and at slow time-limit. In other words, in all the right conditions for serious chess, the kind that counts. And yes, I realise that for the stronger members of our club, beating titled players isn't exceptional. But I am not one of the stronger members of the club. Except for a last round collapse, the rest of the tournament went much better than I had expected too. My four other draws were all against higher graded opponents - including two in the 190s. I went to see Derren Brown in Salisbury earlier this week. It was a fantastic show I'd heartily recommend to everybody were it not for the fact that the rest of the tour is already entirely sold out. I'm hoping for London dates over Christmas or perhaps next year. In the meantime, we can make do with old clips taken from his TV shows. You can, for example, watch him play chess against several grandmasters at once right here. Have a good bank holiday everybody. As far as I know I never met Loki. He never came to Streatham and Brixton chess club, though he lived in Brixton (and, I think, Streatham beforehand) and I asked him several times to come. His real name wasn't Loki - it was a handle on an internet forum. I think I know his real name and the country, Sweden, he was from, but if he'd sat opposite me in a pub I wouldn't have known who he was. We never sat opposite one another at the chessboard: we never played a proper game of chess, though we played a couple of games, winning one apiece, over the internet. It was only through the internet I knew him. Whenever, on that forum, I'd start a thread about chess he'd be sure to contribute. He loved his chess - and he was a better player than he thought. I think he believed that chess clubs were full of top-notch players who would wipe the floor with somebody like him, who for years had played the game only intermittently and on the internet. I told him differently but I don't think he believed me. He didn't seem to have as high an opinion of himself, in general, as others had of him: a couple of years ago he disappeared from sight for a number of months and it was understood he wasn't well. But he came back and people were very pleased to see him: and it was around then that I started trying to get him down the chess club. As I said, I never managed it: but not for any waning of his love of chess. He followed the Kramnik v Topalov match with great excitement, his computer program allowing him to keep at least one step ahead of my own tentative (and largely wrong) analyses on the forum we both used. Blunder! he posted as Topalov played 59...f5 in the first game: I remember it well. I went and looked up the thread again, while writing this note: how he enjoyed that match, all the controversy and all the chess. He registered on Playchess to follow the commentary and read the chat: an old player coming back to the game after rediscovering how much he got out of it. That's what chess clubs are for, I think. For people who want to come back to chess because they remember how much they get out of it. That's one reason why I always wanted to get him down the club. But it can never happen now: from that same forum I learned, just yesterday morning, that on Thursday 17 May Loki died, as the result of an asthma attack. We never knew him. The London League 2006-7 saw Streatham Second Team edge promotion into Division 2. The First Team, meanwhile, started the season hoping only to avoid another relegation dog-fight in Division 1, like the one we just scraped ourselves through the year before. But all our expectations were surpassed. Captain Martin Smith looks back. If you dig in to the Past Champions page of the London League website you can have a “where are they now?” moment. Clapham Common Chess Club, who played al fresco chess in living memory, but no more. Or a “where or what was that?” moment with the clunky Lud-Eagle Chess Club. Or a “haven’t I heard of them before?” moment with Wood Green. And with Streatham - a “will they ever do it again?” moment. Yes, Streatham had its glory days, 1976/77, 1981/2 and 1984/5 - when we were the Champions. Maybe, like Clapham Common, someone, somewhere remembers. But could we ever do it again? Not, this season, we couldn’t. But coming fourth with 6/11 points is our best result for really quite some time. And certainly better than last season when we were scrabbling to avoid relegation. The magic ingredients - solid and strong top boards, dependable middle order and enthusiastic reserves - all came together to give us a highly satisfactory result. The season also saw two brilliances from Jeremy Leake and Robin Haldane, and good wins by John Carlin and Adam Fysh-Foskett, and Tom Chivers. Oh, that we could all play games of this quality. So, let’s muse again on the question: will we ever win the League again to add another title to our current hat-trick? Not with Wood Green fielding GMs down to board 7 we won’t. But if we can maintain something like our squad for next season, we could make sure that unlike Lud-Eagle, future players will at least recognise our name. ... and looking forward to next season, I guess the only thing to add is: good luck! Is this the world's most impractical chess set? 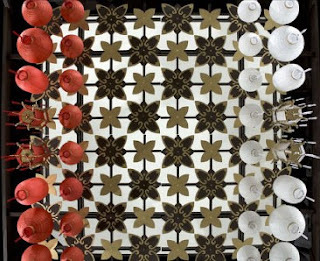 The pieces are not only upside down, but lanterns. Captures, one suspects, might become rather more inflammatory than usual. Still, what a remarkable thing it is, and others certainly seem to like it. squirrelbait of Core77 for instance wrote: "Taking the extra time to move and appreciate the beauty of the suspended pieces only further reinforces the slow, careful nature of chess." While Chris Davies of Slashgear blogged: "I’ve never had much patience for chess - not enough lasers - but the exception has always been those human-sized outdoor sets you play in the garden. 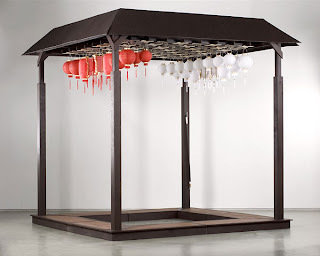 Graphic designer Wei Lieh Lee might have come up with another exception, however, in his Gazebo Chess Set project with Kevin O’Callaghan: an inverted board of hanging lanterns [...] The great thing is, this is something you could quite easily recreate in your own garden; a grid of hooks and some simple paper lanterns would make for a fun summer game that you could leave out even with small children running around, and not have to worry that they’d knock all the pieces over." Mm, maybe. Personally, I think I'm more tempted by the message toaster. Apparently there has been a vote for the best chess game of 2006 - a little late, perhaps? - and the winner is the game that Topalov won against Aronian in Wijk Aan Zee. I'm not sure I'm not a bit sniffy about games which are won by an idea seen in home preparation, however deep the chess understanding on display (it being not at all straightforward to see that White has got more than enough for the exchange). It was a fine game all the same, and I wonder whether the loser had it in mind when he beat Anand this year in Morelia. The finale of that game reminds me a little of the earlier one. Anyway, it got me wondering what would be the Streatham and Brixton Game of the Year for 2006. I'm not in a good position to make a judgement, having only seen the games up to the middle of March (and only those played in the matches I took part in) so any nominations will have to come, as it were, from the floor. So in lieu of that, here's what I think is my best game of 2006. There's an objective basis for the choice: my opponent, the Spanish FIDE Master Antonio López Del Alamo, was the highest rated player that I beat last year (FIDE 2300 when the game was played and a Spanish rating of 2316) and the only titled player I defeated. There were a couple of near-misses - the won ending that I drew against an International Master in Marianske Lazne, or for that matter, the drawn ending that I lost against a Grandmaster in Benasque, a draw against a GM being worth a win against anybody else (at least if, like me, you've lost every time you've played a GM). But it's also a nice game, one typical of the way I like to play if not so typical of the way it usually works out. Keep it simple, point your pieces at the opponent's weaknesses and have faith in a sound position when the complications start. It's a King's Indian Fianchetto, too, an opening with which I have an enormous plus record: and, from a very brief check with the computer, it doesn't seem to be badly flawed. Although I've not always played the best move, I don't seem ever to have thrown it away - which is interesting, since when his rooks came into my position towards the end I wasn't at all sure, at the time, that he didn't have at least a draw. 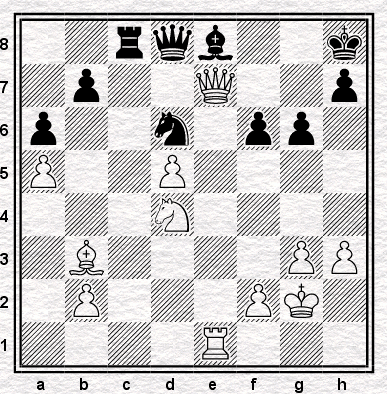 It was played at the same Benasque event as the missed draw against the grandmaster, just a couple of rounds later. Here it is. See if you like it. Is it possible to overlook that you have actually delivered mate? It surely is, just as it is possible to think you have been mated when in fact, you have not. In fact, precisely this event occurred in a game a few years ago featuring a contributor to precisely this blog. The diagram is taken from the game Bryant-Crouch, London League (Division Two) played on 23 September 2004, in a match which Streatham and Brixton ultimately drew. If my memory serves, this may have been because Dave Varley's opponent failed to turn up for a second session in a position where he was winning, this fact, if fact it be, providing a pleasing link back to our original theme (or somewhere near it). Indeed, one of our opponents in the match currently under discussion was the player of the White pieces in our previous "how did the game go?" feature - and he was playing, in this match, the subject of another of last week's postings. Spooky coincidences, no? Somebody tell Jim Plaskett. Anyway, back to the diagram, which occurred shortly after Jonathan had lost back a pawn which he had only just won in his opponent's time trouble. Black has played Rf5-d5, the third check in a row with that particular rook, which has been driving White's king up the board. 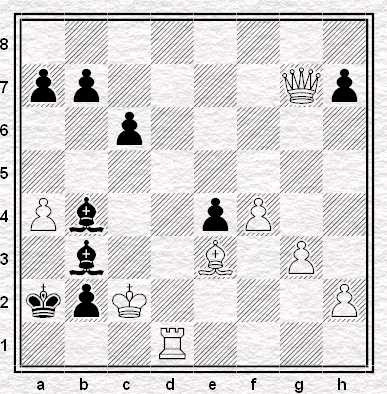 I imagine most readers - except those who have worked out that this series does not tend to involve "best play" - just as they must have spotted that Qf8 mate was obvious in the previous position from this series, will have spotted that Kc6 is both obvious and compulsory here, being, as it is, the only move. 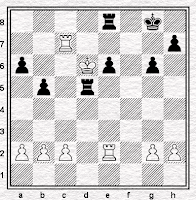 What Black should do then, since he is out of sensible checks and possibly vulnerable to the manouevre 1.Rf2 Rf5 2.Rd2, is not entirely clear, though your suggestions are welcome. Jonathan briefly took stock of the possible squares his king might move to, and seeing them either attacked by his opponent's pieces or already occupied by his own, concluded that his king could not escape the check and was therefore checkmated. "Ah", he said. "That's most unfortunate." And he held out his hand and conceded the game. Clearly a traumatic experience. Jonathan appears to have erased it from his mind entirely. 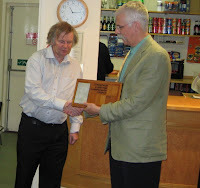 Robin Haldane emerged as the winner of the 2007 Streatham & Brixton Chess Club Championship on Tuesday, after a tense second half of the competition that once again saw no draws, and which was ultimately decided in a blitz play-off. He won a first prize consisting of our spectacularly unspectacular Trophy, and free membership of the Club for next season. Congratulations also go to Chris Morgan, who won the second prize - again free membership for next season, again in a blitz play-off - from the under 100 grade section. Robin was certainly a worthy winner. He'd had the toughest of the pairings in the competition, in which he faced the top four highest-rated players (excluding himself) - beating three of us but losing to Carsten Pedersen. Carsten, however, had previously lost to myself, whilst Adam Fysh-Foskett had lost only to Robin. This trio then were left on 5/6 at the end of this two-leg event, so battled on for outright first in three five-minute blitz games. And by beating both Adam and Carsten in his two, Robin was crowned Champion. There was a similar story for the second prize for players graded under 100, where Chris Morgan, Barry Blackburn, and Stan Rodrigues all finished with 3/6, and where Chris also won both of his blitz play-off games. A photo of the blitz games in action is to the left of this paragraph. What else? The tournament was well-run and organised by our Club President, Angus French, whom we all owe a big thanks. A good-natured, friendly atmosphere pervaded both evenings - away from the violence on the chess board, that is. And the tournament proved an especially good opportunity for Streatham & Brixton Chess Club members such as myself to get to know more players from our neighbours at Streatham Chess Club. Finally, I hope everyone who played in the event enjoyed it. And if you didn't play - how about next year? It was in the bar downstairs at Golden Lane a couple of months ago that Dave Varley dropped the bomb. He had, he said, spotted Servalan, erstwhile Supreme Commander of Federation forces across the universe, more than once on the Northern Line heading into the West End. News to warm the cockles of the heart of any Blake’s 7 fan. After getting over the shock of the realisation that such goddesses walk amongst us, well amongst Dave V at least, I remembered there was an episode of Blake’s 7 that had a very strong chess theme. It took me a while to track it down but eventually I discovered it was Series Two's rather unimaginatively titled, “Gambit”. For reasons I shan't trouble you with, Blake and his crew find themselves at Freedom City. Entertainment is largely to be found at the enormous casino but there is one game of skill available – Speed Chess. House rules are 10 seconds per move for each player, exceeding the time limit being punished by the loss of a pawn. For a prize of a million credits a punter may take on a resident chess expert known as The Klute. Challengers get the White pieces and draw odds but, and here’s the rub, should they lose they are executed for the entertainment of the watching crowd. Frels looks confident - but now we jump to the position after The Klute has played his 13th move. The Klute mated Frels on move 28 then without batting an eyelid hit the 'fry him' button. Frels disappeared in a rather cheap looking special effects flash - perhaps the ultimate answer to the question of whether or not rapid chess is good for you. But what of the missing moves 8-13, 16-22 and 26-27? Can anyone offer any suggestions as to what was actually played? Blake's 7 uber-geeks everywhere await your reply. An appropriately rapid post this one, just to throw the subject open for a wider debate: is the succinct answer to Alexey's request for rapidplay tips here ("My tip: Botvinnik didn't play lightning chess and neither do I") the whole story? Didn't both Fischer and Capablanca each play thousands of blitz games, to enhance their pattern recognition abilities, in today's parlance? Doesn't blitz provide good opening practice - or does it just teach you to be casual? You tell me. Right now I've got to rush off, though. Our position yesterday - somewhat frivolous in nature, I accept, but this is both the weekend and a blog - was a puzzle, but not in the traditional sense. Because the answer, the winning move, is obvious. And if the answer is obvious, is there any puzzle here at all? The answer is obvious, so what's the question? Or put another way - what's the real question? I wonder. 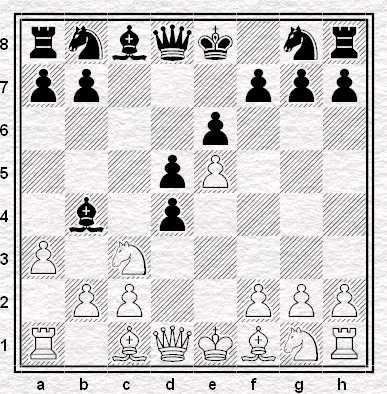 Perhaps it's something like this - why might the winning move not be obvious? Let me explain. The position comes from a match I played for Beckenham, in the Kent League, early in 2006 at Charlton House. My game had finished shortly before and in fact the time control had been reached. Those of us without moves to seal went to have a look at the games that were still in progress, as the match was close and the result depending on the remaining games. This position came from a board below mine - from memory I think I was on board three and this may have been board four. Our player had the white pieces and was, as I say, to seal his next move. While he pondered, so did we, considering the various options, a queen exchange perhaps, or a retreat, or leaving it there for the while. 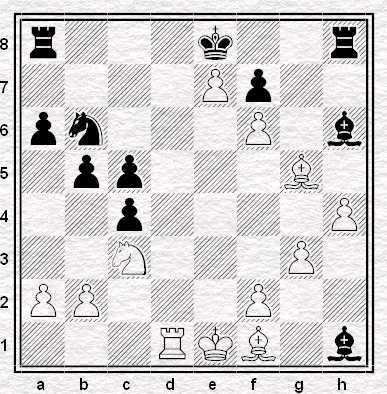 White was a good pawn up and surely should not have too much trouble winning from here. Am I missing something, or is there a mate in one there? followed by a scurry over to the board, a subsequent return and so there is! Amaurosis scacchistica and on a multiple scale. Why would several players, all of them capable and some of them reasonably strong, miss a mate in one? Perhaps because the player at the board didn't see it: perceiving only thought, the spectators assumed there must be something to think about. On the contrary, seeing only a diagram, I would guess that the readers of this column saw only a mate in one. When we see a strong player make a bad move, our first thought is that they have seen something we have not: we see the player, not the board. Like a magician's feint, the player distracts our attention from the board. The truth, however, is in the board and pieces: errare humanaum est, it's the players and those who trust them who make the mistakes. I have been rather shooting my mouth off of late. 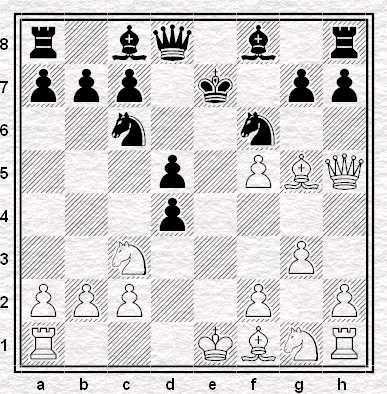 Not satisfied with claiming to be the strongest player in the world (see comments to this post), I also found time to suggest I should be credited with the invention of a variation of the French Defence that virtually forces the win of a pawn. Sadly those that are usually alleged to be amongst the world’s best players continue to avoid me in battle so the only evidence I can produce to back up my claims is to look at what happens when they take me on by proxy – how, in other words, do they get on when challenged with my variation? 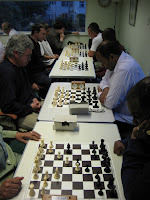 After a few days nurdling around Chess Megabase 2007 I found many examples of World Champions taking on 5. … cxd4. Let’s take a look. Lasker is our first customer who, as I noted last time, faced this line against Maroczy in New York, 1924. 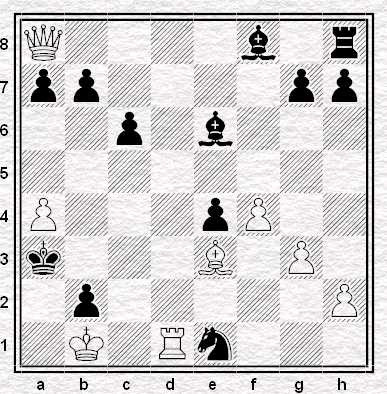 Lasker played, 6. axb4 dxc3, 7. bxc3 Qc7, 8. Nf3 Ne7 and went on to swindle a win in 50 moves but, notwithstanding what Chess Psychiatrist Chivers had to say about this line at the pub quiz last Sunday, most sources assess the position at move 8 as already slightly better for Black. Botvinnik played exactly the same line against Model at the Soviet Championship of 1927 but he was less fortunate, having to resign on move 47. Interestingly enough, after four years to think about it the old Soviet decided the idea was worth a try from the Black side and he used 5. 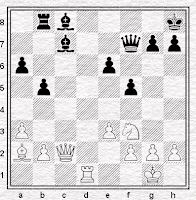 … cxd4 against Yudovich in the 1931 Championship. The game went 6. Qxd4 Nc6, 7. 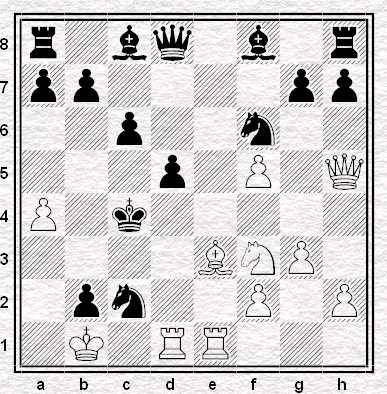 Bb5 to which Botvinnik responded 7. … Ba5 and went on to win in 44. Fischer seemed to struggle in many lines of the French defence and was no more successful against this one. Two games from his famous exhibition tour make it into Megabase. On the 2nd March 1964 he tried, 6. axb4 dxc3, 7. Qg4 cxb2, 8. Bxb2 but went down in just 26 moves. Three weeks later he went for the quieter 6. axb4 dxc3, 7. Nf3 Qc7, 8. Bd3 Ne7, 9. 0-0 Nbc6 but only managed a draw. History doesn’t relate how many other games Bobby was playing at the same time as those given above but is that really an excuse? In any event, Kasparov didn’t do much better and he faced the line in a real game. It was at the Soviet under 20 championship at Riga in 1977 that Efimov tried it against him. 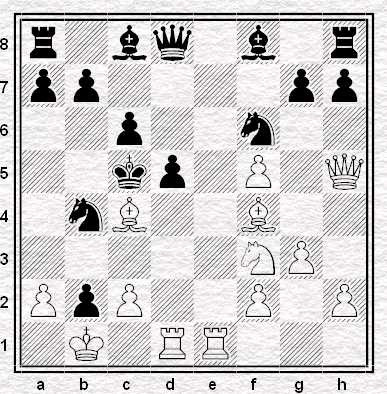 As with Fischer’s first try, Gazza played the most critical response 6. axb4 dxc3, 7. Qg4 but here Efimov varied with 7. … Ne7, 8. 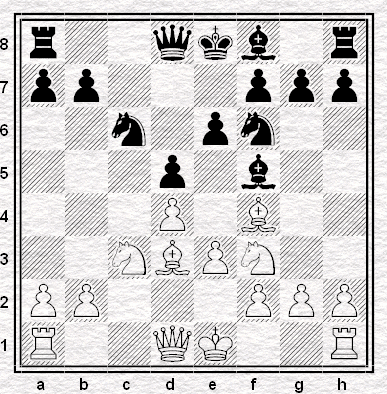 Nf3 Nf5 and the game ended in a draw in just 17 moves. 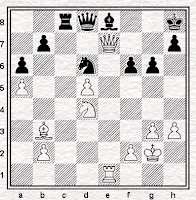 Finally, in a 2004 simul Karpov proved over the board something my home analysis had shown some 15 years earlier – after 6. axb4 dxc3, 7. bxc3 Qc7, 8. Nf3 Qxc3?, 9. Bd2 Qc7, 10. 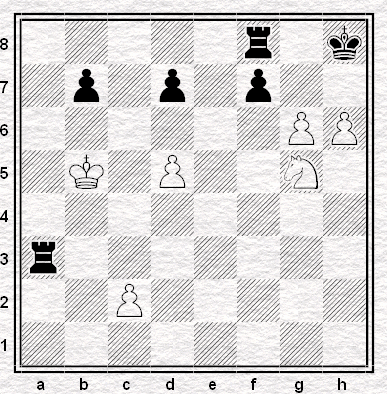 Bd3 Ne7 White gets an enormous attack for the material. Black should definitely leave the pawn alone and play 8. … Ne7, which is where we came in. So there you are. In 7 games involving World Champions and the move 5. … cxd4 the results amount to + 2 = 2 -3. In fact it could have been much better given that one of White’s wins resulted from Black playing a clearly inferior sub-variation and the other was a streaky victory after coming off worse from the opening. I’m sure there will be some cynics and agitators who try to emphasise the fact that some of these games were from simultaneous displays but I think the underlying message is there for all to see. Isn’t it time for the chess world to wake up to 5. 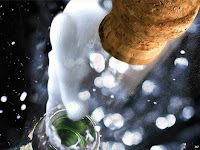 … cxd4 and award it the “! !” it clearly deserves? The first half of Streatham & Brixton Chess Club's 2007 Championship took place last night, consisting of three rounds of quick play chess, down at our venue in Woodfield Grove Tennis Club. Eighteen club members took part including myself - and boy were we all in a violent mood. Of the 27 games played, none were drawn. Take that, super tournaments. But the winner gets more than that eternal engraving, of course. First prize features not only free membership of the club for next year as well - but far more importantly, bragging rights. That's included with second place too, which is a grading prize consisting also of free membership of the club for year. The grading prize will be awarded for the best performance by a player graded under 100 (actual or estimated). See you next week fellow competitors - for another fun, friendly, night of violent chess! Admirers of Monty Python's Life of Brian - especially those fans who can recite practically the whole script - will recall the scene in which Brian (Graham Chapman) is trying to escape his newly-made and unwanted disciples. He jumps into a pit in order to hide - and lands on the foot of the hermit (Terry Jones) who lives there. Jones cries out in pain and thereby breaks a vow of silence which he has kept for eighteen years. Brian pleads with him to keep quiet and not attract the attention of the mob, but as Jones points out, after eighteen years why should he bother? Brian: Oh please, could you be quiet just another five minutes? Hermit : Oh, it doesn't matter now, I might as well enjoy myself. The times in the last eighteen years I've wanted to shout, and sing, and scream my name out! 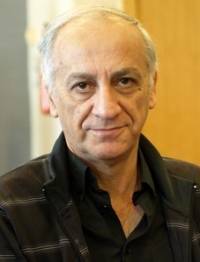 jámas ha ofrecido tablas desde 1978. So I checked and it means exactly what I had thought it to mean. Since 1978, he has never once offered a draw. This is such an astonishing thing to say that far from wondering whether it is true, I assume it is. You couldn't make something like that up. If I seem at all doubtful it is only because one would have thought that a record like that would be so widely-known, so widely-discussed, that we would all have known it already. All sorts of questions arise. Why? Has he assumed the other player will always offer one if it's appropriate - so he doesn't need to? Did he have a bad experience offering a draw, like finding he'd had a won position, and decide "never again"? Against whom was that final, 1978 draw offer made and did that game contribute to his decision? Does he readily agree draws other players offer, but just decline to offer them himself - or does he have a wider objection to the agreement of draws? When he's lost, do his opponents ever wind him up and say "you know, you had a draw for the asking if only you'd offered it"? I wonder if he will play Benasque this year. If he does and I am drawn against him, perhaps I should accidentally step on his foot and see if that causes him, like Terry Jones' hermit, to speak without meaning to - and accidentally offer a draw. You never know, it might set him off and he might find himself offering draws in every game he plays. Just to see what he's been missing. Just to make up for his twenty-nine missing years. If you had to promote the game of chess, using one sentence...what would you write. Be original...don't quote the masters. Be careful, too. "You get to kill people" was greeted with the acronymical reply: "Nobody Ever Really Dies!" Whether it's his reviews in New In Chess, his theoretical work on the Grünfeld, or his two books centred on psychology in chess - Jonathan Rowson is, I think it's fair to say, a much-praised chess writer. His third book has even spawned a Zebra clan - a more promising collective noun than the Zoologically-correct herd, one supposes. And it's increasingly common to hear errors at the board retrospectively explained on his terms: "I was telling myself a Rowsonian narrative, but . . ." - that kind of thing. However, chess playing and improvement is measured in rating increase, and not via interesting conversation. That point is bluntly made over at Rowson's chessgames.com homepage by the kibitzer 'pazzed paun': "Chess for zebras has been on the store shelves for a number of months now- Can anyone out there claim that their chess has improved by studying this particular book? Please do not write that you think the ideas are good or that it got great reviews or some other nonsense!! practical application only please!" A question not decisively answered once in the positive, since it was first asked in November last year, incidentally. And indeed, I don't know anyone who can say: "I followed Rowson's advice, and gained this many grading points." In fact - barring some pragmatic points made in passing, and the suggestion to simulate over-the-board conditions at home to practice concentration - both Chess for Zebras and The Seven Deadly Chess Sins seem rather short on general, concrete advice, that can be applied instrumentally. And as far as I know, there's no exercises in the books with which to test one's self against Rowson's psychological ideas. Even more critically, Rowson's emphasis on psychology offers gratification for the reader in terms of self-recognition: but might that be a quality only in life, but not in chess? If so, the Bobby Fischer quote "I don't believe in psychology. I believe in good moves" - is doubly relevant. But do I really think that . . . ? I should say, I don't claim to know Rowson's books well - although I have done more than glance over them - and I welcome any further critical or positive comments below. Anyhow, with these things bubbling along in my brain, I spectated Rowson's two games at the 4NCL this long weekend. The first saw him fight out a complex draw - against super-Grandmaster David Navara, no less. And in the second, he defeated International Master Simon Williams in 27 moves, thanks to a crisp tactic in the diagram position (Rowson, white, to move.) Impressive stuff from Rowson - and his moves doing the talking. Polugayevsky-Torre, Moscow 1981. White to play his 18th move. 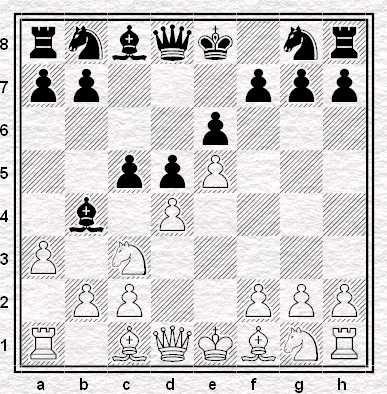 It's one of my favourite chess positions of all time. And for a Sunday, that's all I want to say. The number of visitors to the blog always drops over the weekend. Therefore - and to further encourage that trend - here's just a few little chess things that caught my eye recently. Number one, you can watch The 4NCL Live right now. Alas, they're only covering eight games - meaning you don't get to watch how a certain chess blogger is getting on in his. But the rather exciting encounter between Rowson and Navara ought help compensate. Number two, Hackney Chess Club's second team lost their match versus West London 2 in the Middlesex League Division Three: meaning, promotion to division 2 is denied to them, and Hendon seconds go up instead. So what? Well, this turn of events is, apparently, comparable to Manchester United's exit this week from the Champions League in the San Siro. I guess that makes West London the AC Milan of London chess. Who knew? Incidentally, I wonder what happened to Chessalicious? Since an initial flurry of amusing posts toward the end of March - nothing. Maybe when you've lost a game to an apple, it's time to give up. It must have been twenty years ago that I first discovered the Main Line against the French Defence loses a pawn. No, really. If 6. 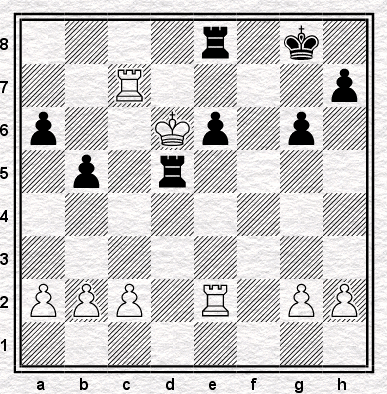 Qxd4 then … Nc6 gaining time so White should probably play 6. axb4 dxc3 when 7. bxc3 looks pretty ugly after 7. … Qc7. Instead White needs to give up a pawn with 7. Nf3 cxb2, 8. Bxb2. I showed this idea to a friend at the club I was playing for at the time. To be honest we were fairly dismissive of 5. … cxd4. Both of us thought it was far too ropey to play in a formal club match although we eventually came to the conclusion that it might be worth a punt in a rapid or casual game. Now I must confess my claim to the naming of this variation is somewhat weakened by the fact that I never did play the line in the end (and I’ve played all sorts of unsound rubbish over the years I assure you). Also, in chess there’s never anything new under the sun and … cxd4 is really an ancient idea anyway. The oldest example my not particularly diligent researches have come up with so far is Maroczy playing it against Lasker in the 1924 New York tournament. Mine or not, I was (and remain) quite fond of the idea, if for no other reason than I discovered it for myself. Imagine my surprise, though, when that well known purveyor of French Defence oddities, Viacheslav Eingorn, gave 5. … cxd4 an outing against John Nunn at the 1990 Reykjavik Four Nations Team tournament. Eingorn played 7. … Ne7 instead of capturing on b2. Apparently this was a Theoretical Novelty at the time although the very amateur (both of us sub 130s) analysis school in that club room all those years ago had already concluded this was the superior plan. Fast forward to April 2007 and the publication of John Watson’s new book, Dangerous Weapons: The French. Now in a recent column in the Guardian, Danny King and Ronan Bennett suggested this book would supercede Watson’s classic, “Play the French”, the latest edition of which was published in 2003. In fact they are totally different kinds of book altogether. One of the chapters is, as you might have guessed by now, dedicated to 5. … cxd4. Watson, even concludes that it might be playable for Black. To be honest I’m not so sure but if you want to check it out amazon have it here. Amazon’s dispatch time is 1-3 weeks so those of you who are like me and can’t delay gratification might want to go to your traditional chess book supplier – although you should be prepared to pay an extra fiver on top of the amazon price. Why do we have chess clubs? In the internet age, the article argues, their primary purpose can no longer be to provide opponents. Therefore: "The main reason we have chess clubs today (as opposed to the past) is to provide a social environment for chess players." Now, on the one hand, my story would seem to confirm this. I lived in London for two years without a chess club, until I encountered one whose members I became friends with. 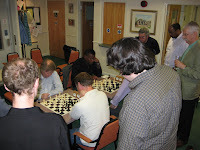 That is - Streatham & Brixton Chess Club. 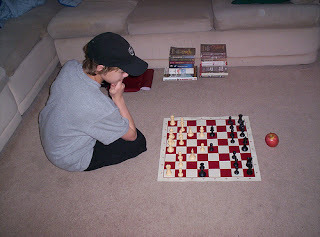 In that period without, I mucked around one heck of a lot with internet chess, too. But on the other hand, this experience of coming back to over-the-board chess enables me to understand other, distinct advantages as well, linked to belonging to a club. Three in particular I think are worth highlighting. Firstly and simply, I think you get the best chess advice from people who know you, have played you, and seen you play regularly. Secondly, I'm retrospectively unconvinced that internet chess is a substitute for over-the-board chess, and measures much at all. Before returning to over-the-board chess, I was fairly comfortable with my internet "improvements": a playchess rating typically between 2200 and 2300, defeats of FMs and IMs, a draw with Nakamura in an ICC simul - all empty brags, and I've not even started on those I can muster from correspondence play. But back at the board, my rating turned out to be in the 160s much as before, as I analyzed last week on the blog. Thirdly and relatedly, by joining a chess club you get a lot more games: from five minute fun in pubs, to serious League stuff. It's pragmatic, in other words. You get to play far more than you could get just by playing expensive weekend tournaments as a lone player, where difficult travel arrangements, extra costs, become necessary and so on. Of course you get less games than on the internet: but, each game counts. You see the opponent, and know they are sober and trying. Even if you beat a titled player on the internet - how do you know they weren't on the phone the whole game, a bottle of booze at their side, bored out of their mind? And so what, even if they were playing their best: no money rested on it, no team result. Nothing, in short, matters that much. So - aside from the social side - the advice, the competition and the experience that being a part of club offers are, I think, unrivalled by the internet. I'm curious as to if you agree - or think otherwise? Have you ever felt, during a chess game, a strong urge to punch your opponent in the face? If so, good news. The door of opportunity is opening for you to do just that, as The World Chess Boxing Federation is recruiting, report The Times. According to Wikipedia, although invented only in 1992, there is already a mounting crisis in the game because “there are long-term concerns about it [chess boxing] being dominated by boxers with little or no chess skills, given the present set of rules. All a player has to do to win without any chess skill is to take only one chess move in the first chess round, then in the first round of boxing knock out their opponent to win overall. 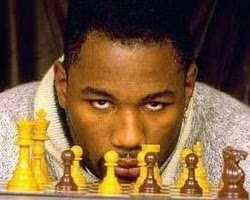 Thus, it is possible for a chessboxer with virtually no chess skills, but phenomenal boxing skills, to dominate the game.” . . . You know I sense a bit of a flaw with chess boxing, don’t you? Maybe, maybe not. It would certainly change the odds in those typically uncomfortable games with talented little juniors. On the other hand, how awful would it be to face a lady player? I have, I think, seven chess sets in all. I used to have eight but one was taken when I was burgled three years ago. It was a magnetic set, which I kept in my bag, and the burglar took the bag: the theft of the set was incidental. I've never heard of a thief deliberately stealing a chess set. Perhaps they're not considered of any value. Perhaps that judgement is wrong: some sets are worth five-figure sums, at least the ones that are on sale tomorrow at Christie's. The set pictured above, for instance, designed by Man Ray in anodised aluminium, is estimated to be worth £10,000-15,000. Along with the other items Christie's are selling, it was part of the collection of the late Jean-Claude Cholet, who according to the literature was "a widely respected orthodontist". Personally I've never heard of him - the only "widely respected" Cholet of my acquaintance is a Womble - but if we're to take "widely respected" as a synonym for "paid a shedload of money" the description would appear to be entirely correct. Anyway, not all the items for sale are quite so expensive so if you're keen to purchase part of M.Cholet's collection you might like to make your way to Christie's tomorrow at two o'clock: or phone Pippa and make a bid by telephone. But hurry, your dentist is probably on the phone already and hoping to buy the lot.